The Select Investigative Panel on Infant Lives has used documents taken from the anti-choice group the New Mexico Alliance for Life (NMAFL) to allege wrongdoing by the University of New Mexico (UNM). After a push from NMAFL to revive the allegations, conservative media outlets have recently begun circulating the panel’s misinformed anti-choice attack against UNM and New Mexico abortion providers. On July 14, the Republican members of Congress’ Select Investigative Panel on Infant Lives released an interim report of its ongoing investigation of abortion providers and medical researchers, which, they allege, were involved in the sale of donated fetal tissue. The select panel was formed in October 2015 after the anti-choice group Center for Medical Progress (CMP) released a series of deceptively edited videos targeting Planned Parenthood and fetal tissue procurement companies. In the past year, CMP’s deceptive videos have been consistently debunked while multiple state investigations have cleared Planned Parenthood of any wrongdoing. Meanwhile, CMP and its founder David Daleiden have been indicted for fraud by a grand jury in Houston, TX, have been subject to several lawsuits, and have had their work soundly rejected by multiple judges and journalists. Undeterred, Republican members of the select panel have sourced numerous documents from CMP’s website and videos to use as “evidence” in their ongoing campaign against Planned Parenthood. Despite calls by congressional Democrats and 50 organizations to disband the panel, House Speaker Paul Ryan has reiterated his support for its work. Furthermore, the House Administration Committee has also approved supplemental funding for the panel’s continued operation. In another section of the report, the panel’s Republican members recounted their recommendation to the Department of Health and Human Services that the tissue procurement company StemExpress be investigated for violating federal patient privacy laws. The panel alleged that StemExpress employees placed in abortion clinics were allowed too much access to patients’ private medical information in order to assess candidates for potential fetal tissue donation. Having found no smoking guns in the University of New Mexico and StemExpress cases, the panel has passed its allegations to other authorities to settle while it continues to search for criminality. Beyond that, the report does little more than serve the panel’s antiabortion narrative in which clinics are desperate to get more business, fetal tissue companies are intent on getting more product, and the technicians who collect these specimens send out emails blithely discussing fetal organs and limbs. Even if this portrait were accurate — and the panel offers little evidence to back that up — it establishes no wrongdoing. Today, the Republican members of Congress’ Select Investigative Panel on Infant Lives released an interim update to House leadership and held a press conference to update the media on its investigation of abortion providers and medical researchers across the country. In reality, these allegations are actually recycled misinformation from anti-choice groups that right-wing media have spent the better part of the past year attempting to misrepresent as truth. With this latest release, the select panel Republicans have confirmed the long-held suspicion that they are also merely carrying water for the unfounded allegations of anti-choice extremists. Since the select panel’s inception, the media have criticized its actions as a politically motivated “witch hunt” -- a “Benghazi treatment” of Planned Parenthood. In its 10 months of operation, the select panel has found no substantiated evidence of wrongdoing, prompting one publication to call its efforts “a wild goose chase” and numerous lawmakers to call for its disbandment. Instead, the select panel has continued to function merely as a conduit through which anti-choice groups have consistently funneled information in order to give their otherwise baseless attacks a thin veneer of legitimacy. 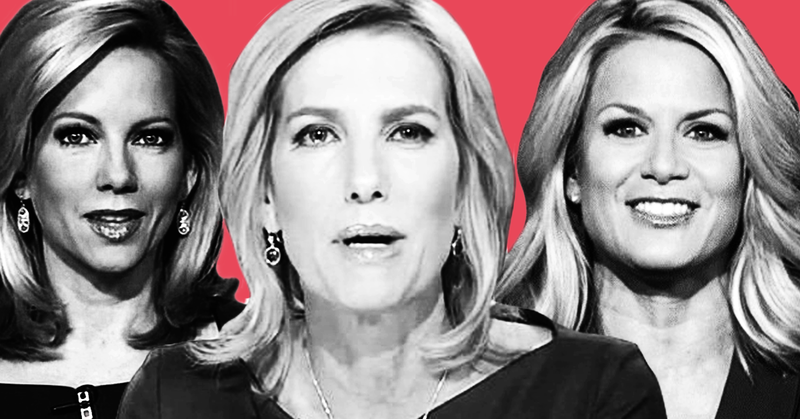 As the panel’s ranking Democrat, Rep. Jan Schakowsky (D-IL), explained, Blackburn and her colleagues have long been suspected of “relying on information from anti-abortion extremists” in order to substantiate their otherwise unfounded attacks. Media Matters has previously reported that numerous documents from the select panel’s submitted evidence could be sourced to the website of the anti-choice group Center for Medical Progress (CMP.) The panel’s interim update confirms this pattern -- including citations from numerous anti-choice groups such as CMP, Life News, the Charlotte Lozier Institute, and the Radiance Foundation. The select panel was formed in October 2015, several months after CMP began releasing deceptively edited videos in an attempt to smear Planned Parenthood. Although these videos purported to show Planned Parenthood officials discussing the illicit sale of donated fetal tissue, they have been repeatedly discredited and multiple states investigations have cleared Planned Parenthood of wrongdoing. 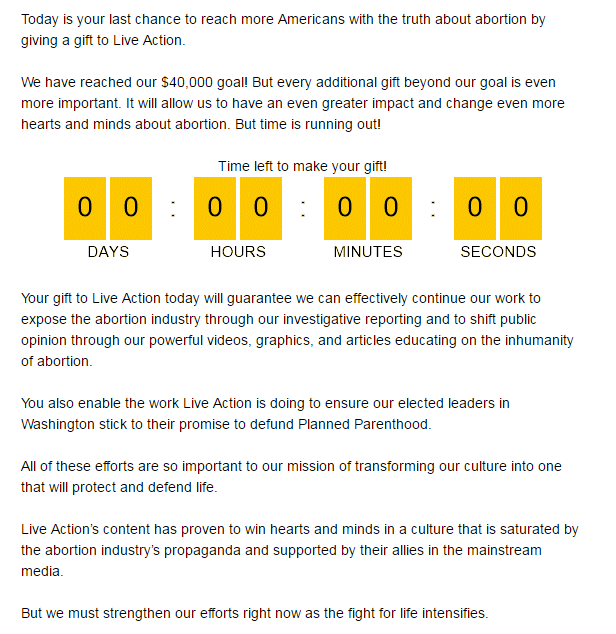 Today marks exactly one year since CMP began its smear campaign against Planned Parenthood. In contrast, for the abortion providers and researchers targeted by CMP and the select panel, the past year has been marked by increased harassment, threats, and violence. According to the National Abortion Federation, in 2015 there was a “dramatic increase in hate speech and internet harassment, death threats, attempted murder, and murder” of abortion providers -- likely inspired by CMP’s incendiary allegations and rhetoric. Since the release of CMP’s first video in July 2015, at least five Planned Parenthood facilities have been attacked. In September 2015, the FBI released an intelligence assessment that warned of an uptick in violence against abortion providers and clinics. This prediction was borne out tragically in November 2015 when suspected shooter Robert Dear killed three people and injured several more at a Colorado Planned Parenthood health care center. Nevertheless, the select panel has recklessly issued countless subpoenas demanding the names not only of abortion providers, but also of the “researchers, graduate students, laboratory technicians and administrative personnel” who may have participated in fetal tissue research. Right-wing media have also spent the past year giving CMP a platform and capitalizing on the opportunity to push misinformation about Planned Parenthood and agitate for the organization to be defunded. In a recent study, Media Matters found that during a 14-month period from January 1, 2015, through March 6, 2016, Fox News’ evening news programs routinely relied on extreme anti-choice figures and information to help propagate CMP’s false allegations against Planned Parenthood. For example, in a single day Fox News devoted 10 segments to hyping CMP’s videos and false claims about Planned Parenthood. Similarly, Fox host Bill O'Reilly called for an FBI investigation into Planned Parenthood, while network correspondent Peter Doocy claimed that he “searched the Planned Parenthood website for fetal baby part prices” but didn’t get any results because the practice is a “well-kept secret.” Other conservative media figures used CMP's videos to compare Planned Parenthood to Nazis, and used the videos to call for completely defunding the women's health care provider -- even going so far as to demand a government shutdown to do so. These calls have made their way to anti-choice legislators across the United States and prompted 10 states to attempt to defund Planned Parenthood -- despite the detrimental impact this move would have on health care access in many communities. Once again Republicans are making inflammatory claims that they cannot substantiate and relying on manufactured documents and fraudulent videos that have been thoroughly discredited. Never before have I witnessed such a disconnect between allegations and the facts. If the Panel were just a waste of taxpayer money and congressional time, it would be bad enough. But this has serious and devastating effects on real people. If you rely on Planned Parenthood provided health care, they want to close women's clinics. If you think women should make their own health decisions, they want politicians to dictate your choices and limit your right to decide when and whether to have children based on your own situation. If you support medical research, their attacks on fetal tissue research are already stalling work on diseases like MS.
And if you believe that congressional Republicans care about individual privacy and safety, you would have learned otherwise today. Despite public promises to “act responsibly with each and every name” that they are collecting -- Republicans today publicly named names without regard to the consequences. Their interim report, which Democrats learned about through a press advisory, proves that this Panel needs to be disbanded now, before more lives are put at risk. The origin of the Select Investigative Panel on Infant Lives chaired by Congressman Marsha Blackburn, R-Brentwood, emanated from a false narrative. The 14-member bipartisan panel has pivoted since doctored video claimed dishonestly that Planned Parenthood trafficked in fetal parts and organs — the reason the panel was approved by Congress in the first place in October. Over the past few months, the panel has fallen into mission creep and it needs to regain its focus if it is going to be taken seriously. Issued subpoenas to nearly a dozen companies, medical professionals or health organizations. Targeted biomedical company StemExpress, which purchases fetal tissue from abortion clinics and sells it to medical research organizations. Announced it was investigating a Maryland late-term abortion doctor, potentially putting him in danger by naming him and his clinic. 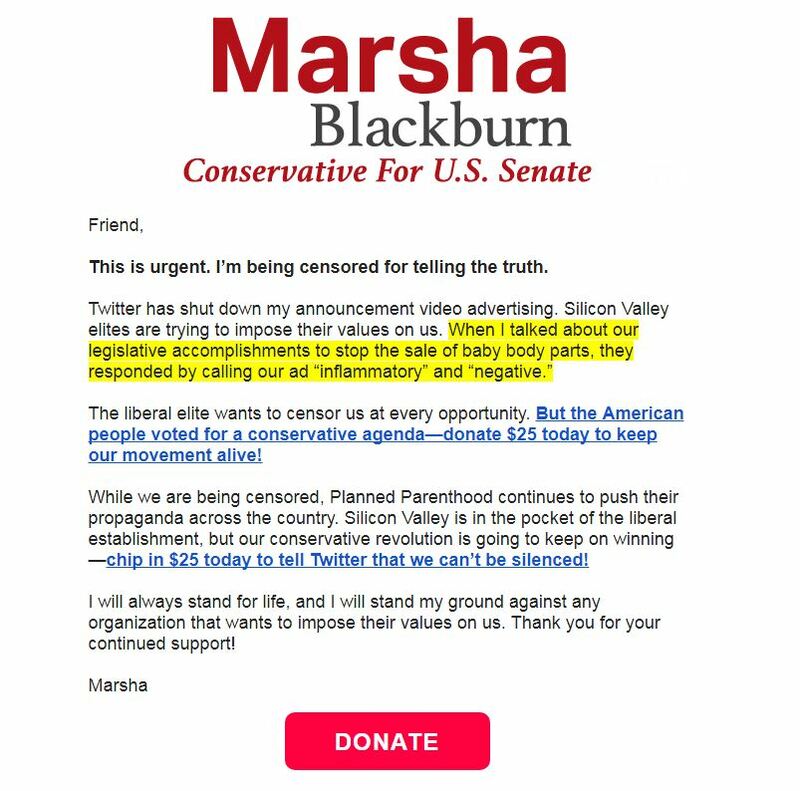 Blackburn downplayed the Planned Parenthood connection saying she had requested no documents from or issued subpoenas to the health organization. Anyone — pro-choice or pro-life — should be horrified at the thought of an illicit market for fetal parts. However, if it does not exist, the panel would do best to wrap up its work quickly. Right now, the panel is creating the perception that it is embroiled in a wild goose chase. 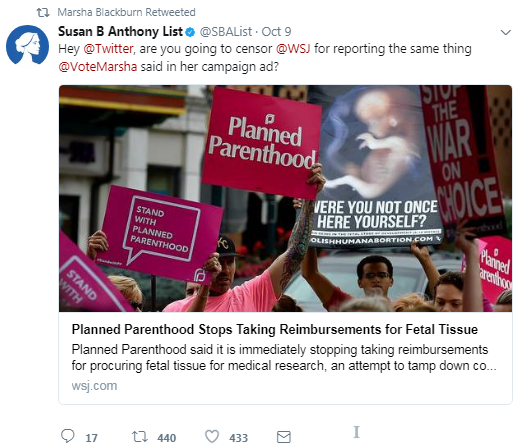 In a June 10 speech at the Faith & Freedom Coalition conference, the chairman of the Congressional Select Investigative Panel on Infant Lives, Rep. Marsha Blackburn (R-TN), used documents taken from the discredited anti-choice group the Center for Medical Progress (CMP) to attack the fetal tissue donation process. Since its inception in response to deceptively edited CMP videos, the select panel has utilized a number of CMP documents to allege wrongdoing by abortion providers and tissue procurement companies. 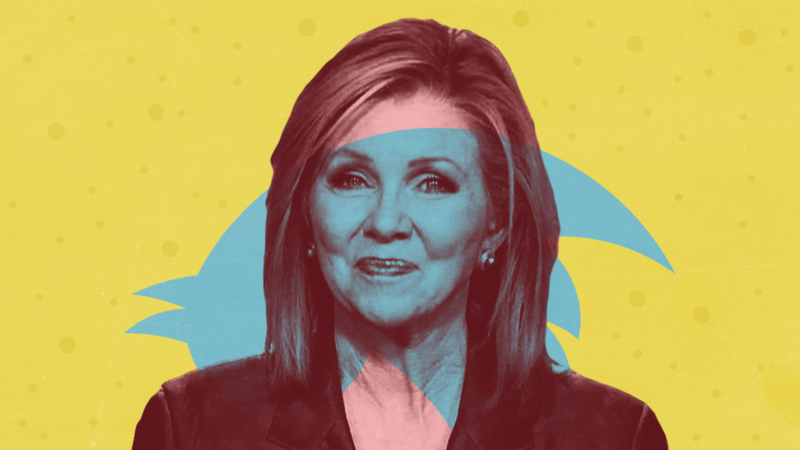 On June 1, Rep. Marsha Blackburn (R-TN), the chairman of the Congressional Select Investigative Panel on Infant Lives, released two letters and a press release calling for an investigation into “potential violations of federal law” by the tissue procurement company, StemExpress, and several abortion providers. Like previous claims made by Republicans on the select panel, the letters relied heavily on documents taken directly from the discredited work of the anti-choice group Center for Medical Progress (CMP). Any doubt about the kind of investigation into fetal tissue research that would be conducted by a special House panel was erased at its first hearing, when one of the witnesses called by Republicans drew comparisons between this life-saving medical work and the experiments of Nazi war criminal Josef Mengele. And the panel has gone downhill since. The committee has issued indiscriminate subpoenas, intimidated witnesses and relied on misleading information. It is abusing power at taxpayer expense, and Democrats are right to demand its shutdown. There is no legitimate reason for this inquiry. Individuals and organizations are being unfairly targeted and placed at risk. [House Speaker Paul] Ryan, who took office with talk of wanting to change how the House does business, should put an end to these sordid proceedings. Since July the anti-choice group Center for Medical Progress (CMP) has released a series of deceptively edited videos purporting to show that Planned Parenthood illicitly sells fetal tissue. Despite the fact that a growing number of states and the U.S. Department of Health and Human Services have found no wrongdoing on the part of the women’s health organization, right-wing media and lawmakers have used the videos to target Planned Parenthood. Additionally, since the release of the videos, at least four Planned Parenthood clinics have been attacked in what law enforcement authorities consider possible acts of domestic terrorism, and an anti-choice activist has admitted that “over-heated rhetoric” and smears could be partially to blame for anti-choice violence. House Republicans have made a public enemy out of Planned Parenthood, of course, but they're not stopping there. They also have their eye on companies that handle fetal tissue, medical researchers, and even medical students — essentially, anyone the committee can find who has a tangential connection to the issue, except those who brought the spurious allegations about "selling baby parts" in the first place. Meanwhile, the scrutiny is interfering with the jobs of scientists and medical providers. At best, they live in fear of a subpoena; at worst, there's a target on their back for violence from anti-abortion extremists. Doctors who provide safe, legal abortion already live this nightmare every day. Public witch hunts like this House panel certainly aren't helping that. But they are helping to make sure that scientists and researchers will get to experience the same treatment. How did we get here? Last summer, a series of anti-abortion videos, produced by the Center for Medical Progress (CMP) and its founder David Daleiden, came out claiming that "Planned Parenthood sells baby parts." Since then, it's become clear that the videos are blatant propaganda. That's not just my conclusion, but the conclusion that most credible media organizations couldn't ignore after learning the facts. Fetal tissue research is incredibly important. It brought us the vaccines against polio and chicken pox, and it could one day bring us the cure to Alzheimer's or diabetes. But because of the videos, this entire field is now under attack. Some states have started passing or proposing laws against fetal tissue research, including Indiana's bizarre new "bury your miscarriage" law that effectively bans tissue donation. And now the attack has moved to the federal level. It's bad enough to risk intimidating scientists and young researchers out of entering an important field. But it gets even worse. The House's "Panel on Infant Lives" also rests on top of a giant powder keg of anti-abortion extremism, which has already exploded once in 2015's shocking escalation of violence against abortion providers. Whole books have been written about the systematic terrorism that abortion providers, clinic staff, and volunteers are threatened with every day — from stalking and threats, to "Wanted" posters that feature doctors' photos and addresses, to vandalism and firebombs at clinics. It's bad enough that the videos and the endless political outrage around them undoubtedly caused more of this violence. But now, the people who use fetal tissue research to try to cure disease are also being terrorized. One university researcher spoke to the New York Times on condition of anonymity because the threats he's received have led his institution to post a guard outside his laboratory. Congressional investigations aren't supposed to work like trials. They're supposed to work like investigations. Being dragged into the limelight by Congress to talk about fetuses, or being forced to have their name entered into a public record because they work with fetuses, could be legitimately dangerous for scientists and researchers like these. It doesn't matter how many times CMP's claims have been proven wrong, or how often Daleiden's years-long history with other dubious smear campaigns gets pointed out. To some anti-abortion Republicans in Congress, these videos will always be indisputable evidence that Planned Parenthood was caught on tape doing something both immoral and illegal, and that these claims deserve serious investigation. It doesn't matter how much time or money all of this costs lawmakers or taxpayers. It doesn't matter that violent threats against abortion providers skyrocketed in 2015, and that a gunman ranting about "baby parts" shot up a Planned Parenthood in November in the deadliest-ever attack on a US abortion clinic. It doesn't matter how many investigations there have already been, and it never will. For the anti-abortion movement and their supporters in Congress, there will always be more investigating to do. There's always the chance that this time, they'll finally expose Planned Parenthood's evil deeds for all the world to see. On April 20, Congress’ Select Investigative Panel on Infant Lives held its second hearing: “The Pricing of Fetal Tissue.” Republicans in Congress established the panel following baseless allegations from the discredited anti-choice group Center for Medical Progress (CMP) against Planned Parenthood. During the second hearing, the panel again relied on evidence taken directly from CMP’s videos and website to attack abortion providers and fetal tissue research.